Full Duplex inter-connection of four RS232C Data Terminal Equipments. Data Transmission is on REAL TIME and not STORE AND FORWARD. Works upto a distance of 20Kmts. Single Mode/Multi mode options available. 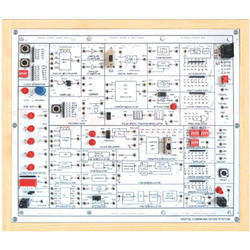 Technic RIDER Series are used for Emergency Communication System. It can be used to connect to any different locations with one button press. Technic RIDER series are available in series of 6 i.e. 6, 12, 24, 36 locations and so on. Below two standard models have been show for reference. The need to effectively communicate is essential. We install and advise on Talkback systems and other communication systems for all technical applications. We also provide consultancy and services to distribute media to multiple platforms. - Maximum number of Simple Telephone extensions -64. - VOIP compatible, enabling you to make maximum use of the existing network links between offices and cutting call costs. - Computer Telephony Integration (CTI) enables telephone system and PC to act as one co-ordinated business tool. Digital Communication Systems is a complete solution to learn & develop concepts of Software in a real-time environment.